Since 1965 Tibet has been administered by the Chinese government as the Tibet Autonomous Region. The government is led by the regional Communist Party secretary, the most powerful figure in Tibet who is sort of like a state governor in the U.S. He is appointed by the Communist Party in Beijing. The Communist Party, aware that Buddhism is central to Tibetans, has tried to select and prop up lamas who will support the government while still retaining legitimacy among the people. The governor is the figurehead regional leader in Tibet. In January 2010, Beijing announced it choice for the new governor of Tibet, Padma Choling, an ethnic Tibetan who served for 17 years in the People’s Liberation Army. Qiangba Puncong, the governor of Tibet during the uprising in 2008, was also a Tibetan. Tibet is a highly sensitive region, not just because of continued local opposition to Chinese control, but because of the region's strategic position next to neighbors India, Nepal and Myanmar. China rejects criticism of its policies in Tibet, saying its rule, since Communist Chinese troops "peacefully liberated" the region in 1950, ended serfdom and brought development to a backward, poverty-stricken region. China tries to keep control in Tibet by making sure there is at least one Chinese official in even the most remote corners of Tibet. Even though Tibetans make up about two thirds of the government employees in Tibet, Chinese officials hold all the important administrative positions. The Chinese government demands loyalty among its Tibetan employees. Tibetan officials that speak up for the use of the Tibetan language or cultural or religious rights run the risk of being labeled as separatists and being demoted, fired or even arrested. Every March Tibetan work units are ordered to warn people not to celebrate the Dalai Lama’s birthday. Employees that don't go along risk being fired from their jobs. Government employees also can not display pictures of the Dalai Lama without risk of being dismissed. Chinese propaganda often refers to Tibet as “a once remote and backward place.” Videos show Tibetans singing in Mandarin of their love for the Chinese motherland. Pictures of Chinese President Hu Jintao have been Tibetanized with the Chinese President wearing a khatang, superimposed over images of Potala Plaza and enthusiastic Tibetan dancers in traditional costumes. The phrase “parent of all gods” entered the news during the crisis in Tibet in 2008, when the “autonomous region's” party secretary declared that the Communist Party was the “real Buddha” for Tibetans. Most Chinese have long since absorbed the government side of the Tibetan issue promulgated in textbooks, on television and in newspapers.Orville Shell told Atlantic Monthly, "I don’t think there is any more sensitive issue with the possible exception of Taiwan, because it grows out of the dream of a unified motherland---a dream that historically speaking has been the goal of almost every Chinese leader. The issue touches on sovereignty, it touches on unity of Chinese territory, and especially it touches on the issue of the West, a predator, the violator of Chinese sovereignty." The Chinese insist that their army freed Tibetans from theocratic slavery and that Tibet is inseparable from China. The Chinese government has released a series of papers on how its rule has created a safer and more prosperous Tibet. Some Chinese have admitted that maybe they went too far in Tibet and say it was a mistake to invade Tibet. Others believe that China has been too soft on Tibet. Many officials in Beijing believe that liberal cultural polices have only encouraged the Tibetans to more actively seek independence. By limiting cultural and religious expression, many Chinese believe, they also limit calls for independence. See Religion. Chinese know little about the Tibetan interpretation of Tibetan history because their textbooks only present the Communist Party’s interpretation of events. They also feel that Tibetans receive special subsidies and benefits that other groups in China don't receive and for the Tibetans to complain is seen as ingratitude. In 2008, when President Hu Jintao said, “stability in Tibet concerns the stability of the country” he had China’s 56 officially recognized ethnic groups in mind not only Tibetans. Chinese arguments that cracking down on Tibet are necessary to maintain national security and stability make sense to a population that recalls the chaos of the Cultural Revolution. This was not what Mao Tse-tung envisioned when he sent his People's Liberation Army to invade Tibet in 1950. He knew the move posed a complex political and military challenge, but he hoped a quick success would secure the tiny nation for China before the West could rise to support any Tibetan resistance. Yet today, some six decades after the area was conquered, and after many years of efforts by Beijing to repopulate the area with ethnic Chinese, Tibet remains un-won. And China, usually so adroit at avoiding diplomatic reversals, has drawn global condemnation for its policies in Tibet, even while so little progress is made there. The People's Liberation Army occupation grinds on, and the world watches as Chinese soldiers patrol Lhasa's streets with fire extinguishers, ready to douse self-immolators protesting Beijing's rule. Tibetan resistance to Han culture has been paralleled over the last half a century by a deep sympathy in the West for traditional Tibet. This has introduced a new and different dimension to China's Tibet problem. Western infatuation with the Tibetan myth has enabled Tibetans to exercise a unique "soft power" — the power of moral condemnation — that Beijing can neither control nor ameliorate. It is a soft power that has raised profound questions about the values that inform Chinese society and governance. Most vexing for Beijing, it has slowed China's progress on the world stage. One of the key elements of the 15-year plan for Tibet released by Beijing in 1996 was the silencing of the Dalai Lama, who is accused of trying "to overthrown the people's government and split the motherland." In a chapter concerning "The Struggle against Splitism," the plan proclaimed: "A great number of facts testify that the Dalai is the chief villain of the political clique that is promoting Tibetan independence...We must expand and deepen and publicly expose and criticize the Dalai Lama, stripping away the cloak of being a 'religious leader.'" The plan continued: "We must ensure that the broad masses of the people clearly understand that what he is advocating with his so-called 'Tibetan independence' 'high level autonomy' and 'greater Tibetan region' is really opposition to the Communist Party." Strike Hard, a law and order campaign launched by Jiang Zemin in 1996, not only targeted criminals it also crackdown on "splittists" in Tibet, Xinjiang and Inner Mongolia. The Tibetan Daily warned "a long-term, bitter, complex, 'you die. I live' political battle with no possibility of compromise." Chinese Government Loosening Up in Tibet? Why Doesn’t Beijing Open Up More on Tibet? Since 1959 the Chinese government has spent more than $30 billion in Tibet and increased life expectancy from 35.5 to 67 years and raised GDP from 142 yuan to 13,861 yuan. The government has built hundreds of villages outfit with modest but relatively comfortable homes that cost around $7,500 and are vast improvement over the houses villagers lived in before. 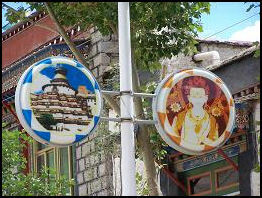 Street signs in Gyantse Tibetans are allowed to ignore the one-child policy and have three children. They pay virtually no taxes, receive tax-free leases on land, low-interest loans are duty-free imports from Nepal. Tibetans have also been afforded the same affirmative action policies afforded other minorities: in some cases they have been given preferences for university admission and government promotions. In recent years a program to resettle Tibet’s nomads into apartments or cinder-block houses and fence off their vast grasslands has gathered pace. The Chinese believe they have helped the Tibetans progress and modernize at a great expense. Before the arrival of the Chinese, Tibet had no roads, no electricity, no modern medicine and no education outside the monasteries. The Chinese are credited with ending feudalism, slavery and theocracy in Tibet and introducing land reform. Under the Chinese, life expectancy among Tibetans has doubled, a greater variety of food is available, and the levels of illiteracy have been greatly reduced. The Chinese spend several billion dollars a year in Tibet to provide subsidies and build roads, schools, hospitals and other infrastructure projects. This is more than in any other province. Although the Chinese have taken minerals and timber out of Tibet, they have spent far more in Tibet than they have received and have also ordered every Chinese province and several state companies to invest in Tibet. In spite of the money poured into Tibet, however, it remains one of the poorest regions in China. In a major speech marking the opening of National People’s Congress in March 2010, Chinese Premier Wen Jiabao promised to expand growth and development in Xinjiang and Tibet. The central government invested $3 billion in the Tibet Autonomous Region in 2009, a 31 percent increase over 2008. Tibetan infrastructure has helped unit a people divided by harsh terrain. Tibetan towns are now more modern—in terms of electrification, education, hospitals, and other public facilities— than they were before. The Chinese have a hard time understanding why the schools, factories and roads they built in Tibet are not appreciated more by the Tibetans. What they have failed to realize is that many Tibetans do not want their help and would rather modernize and progress on their own terms as the Bhutanese, a people similar to the Tibetans, have been able to do in Bhutan. Some Western observers villianize development. But Tibetans don’t necessarily see it that way. They don’t resent development, they mainly object to the way they have been left out. Increasingly Tibetans are torn between their desire to get rid of the Chinese and their dependence on the jobs, opportunities and development that the Chinese bring. Beijing has a number of rural development programs going on in Tibet. These include efforts to help farmers and herders earn more income by finding new use for yaks and teaching highlanders how to grow profitable mushrooms (See Qamdo, Places). Some Chinese projects---including gas stations that don't have working pumps and a cargo depot built across town from its suppliers---have been poorly planned and shoddily built. Many Chinese have signed up to do Peace-Corps-style work in Tibet with Volunteers Aiding Tibet. Doctors, technicians and managers are sent to Tibet on three year contracts, often with promises of promotion when they return home. When asked why he signed up to be a volunteer in Tibet one teacher told Atlantic Monthly, "Because all of us know that Tibet is a less developed place that needs skilled people." Other say they have gone adventure, the natural beauty of the place---reasons that are not all that different from the reasons American Peace Corp volunteers give. All the development has benefitted Tibetans relatively little. Their illiteracy rate is still four times higher than that of neighboring Sichuan Province. There are one forth fewer vocational schools than in the rest of China. Traditionally Tibetans merged politics and religion but left military matters to outsiders such as the Mongolians and Chinese. Today Tibet is important militarily to China particularly as front line against India. Tibet is filled with army camps and gun emplacements. On the roads it is not uncommon to see convoys of grim faced Chinese troops in olive drab trucks. The Tibetans don’t even like to make eye contact with them. There are approximately 40,000 Chinese soldiers in the Tibetan Autonomous region and every town has an army or paramilitary police garrison. Chinese army and government posts are called "administrative centers." To mark the 20th anniversary of the Tibetan Autonomous Region, Lhasa was sealed off from the foreign press and turned into a military compound with soldiers with automatic weapons stationed on top of Potala Palace.